SMS Assist, provides a fully managed business solution to more than 140,000 client locations with its network of over 20,000 affiliate subcontractors. Using its unique business model and proprietary cloud-based technology platform, SMS Assist continuously reduces client costs to maintain their properties, while improving service quality and speed of delivery. SMS Assist is a Pritzker Group portfolio company. To provide clients peace of mind for their multi-property portfolios. Service over 1 million unique locations. • Reduce the average ticket cost for our clients by utilizing technology and innovation. 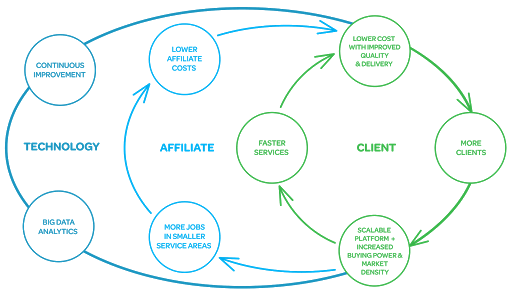 • Add value to our Affiliates by reducing their operating costs and improving route density. • Provide best-in-class customer service. • Be the employer of choice. "You have to be innovative, provide high-quality services, be proactive and be adaptive to succeed. Everything has already been done the old way. Find a new way to do it better, or someone else will." 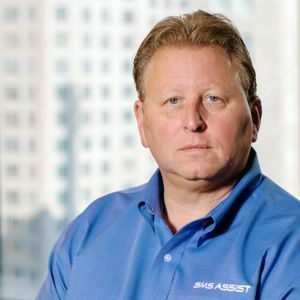 SMS Assist was founded on the belief that technology can make the facilities maintenance business more efficient and, more importantly, add value for the clients we served. Here are some key moments that have shaped SMS Assist into the company it is today. Incorporated in 1999, SMS Assist began as a floor care company with only 10 employees. Mike Rothman took leadership of the company in the early 2000s, and SMS Assist launched its first proprietary technology platform, Service Track, in 2005. In 2008, SMS Assist was awarded a national small box retail account, and in 2009, SMART Facilities Services merged with SMS Assist adding the Facilities department. Throughout this time, SMS continued expanding their offerings to include snow and ice management, landscaping, and parking lot maintenance. The year 2011 brought the Pritzker Group Venture Capital’s (PGVC) first investment of $17 million and three members joined the SMS Assist Board of Directors. As SMS Assist continued to experience rapid growth, the company relocated its headquarters to the John Hancock Center in 2012. That same year, SMS Assist won the Chicago Innovation Award for its advanced technology platform. PGVC also invested an additional $45 million dollars in 2013. SMS Assist launched their first mobile app and continued to experience tremendous growth. In 2014, SMS Assist successfully entered the residential service market and was awarded over 20,000 single-family rental (SFR) locations. As the SMS Assist client portfolio continued to grow, many new team members joined SMS. To fuel additional growth and innovation, Insight Venture Partners invested $45 million dollars and added a member to the SMS Assist board. 2016 marked the launch of One by SMS Assist, SMS’s most innovative technology platform. Currently, SMS Assist has grown to over 700 team members and now services over 140,000 client locations. SMS created a proprietary technology platform in which every client and Affiliate can communicate seamlessly with SMS Assist. With constant platform innovation, SMS now integrates Affiliate service providers through a mobile app, using GPS technology to instantly validate all services provided. SMS Assist’s unique business model and innovative technology has been recognized both locally and nationally.